Dr Anna McBride has been sued for medical negligence - a case of delayed diagnosis necessitating the amputation of a young man’s leg. As the date for mediation draws closer, Anna’s world begins to fray at the edges. Her daily work as a doctor, once routine, becomes increasingly difficult as she scrutinises her every action and questions her worth. Deeply ashamed of her mistake, she retreats into family life, only to become aware of her husband’s growing interest in a younger woman. As the lawyers' demands become ever more pressing, Anna also vaguely senses someone else’s cries for attention - someone who wishes her harm. Will her work, her marriage, her family survive? Melbourne GP Dr Anna McBride is suffering under the weight of a three-year-old malpractice suit. Her carefully constructed life is disintegrating, both personally and professionally. The tone of the novel is oddly detached, intensely inwardly focused. Anna, a perfectionist ill-equipped to cope with this one terrible mistake, watches and analyses her every action and inaction. The language of lawyers (neglect, exposing or covering oneself) seeps deep into her consciousness. As the circumstances of her case are splashed across the papers, her husband seems to be infatuated with a younger work colleague. Certainly, he is slipping away from her. As she takes apart and examines her life, struggling not to drown in her own guilty conscience, she builds a revealing picture of her life for the reader, piece by meticulous piece. 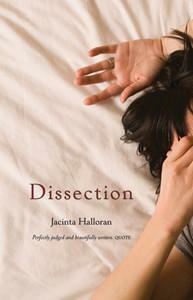 Helen Garner will launch Dissection, and Halloran possesses Garner’s knack for the poetic and telling domestic detail. (For example, the neglected back lawn is an early symbol and metaphor for their untended marriage.) The detailed illustration of Anna’s professional life: the ethical and social elements of working as a GP, and the medical details of her patients past and present, are curiously fascinating, too – an added bonus for the reader. This is a powerful and elegant meditation on the power of one mistake to destroy a life – and an impressive study of an unravelling mind.